Many will know Pablo Picasso’s paintings and his most popular pieces carry a distinct style that is instantly recognisable. Fewer people, perhaps, will know Pablo Picasso; serial adulterer and user of women or the impact that associating with him had on the lives of those who claimed to love him. This is not a play about Picasso ‘the artist’. In many ways, this is not a play about Picasso at all. Told in a series of monologues – almost vignettes – Picasso’s Women focuses on exactly what it appears to; a selection of the women who were Picasso’s lovers and the inspiration for some of his greatest work. The three characters in question are; Fernande Olivier (Judith Paris) – Picasso’s first muse and first recorded mistress, Olga Khokhlova (Colette Redgrave) – Picasso’s wife legally until her death in 1955 and, Marie-Therese Walter (Kirsten Moore) – Picasso’s mistress during and after his marriage to Khokhlova and the nuances of each are strongly and emotively portrayed giving a real sense of what it may have been like to speak to these women, now long passed. 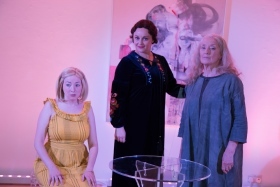 There is, of course, a fourth character in the form of the off-stage Picasso himself and each of the three women offer up their story, in turn, addressing the artist directly. An unexpected stylistic choice that adds drama to the production and adds a little more of a conspiratorial feel – as if the audience were spying on their private conversation. I do, however, wonder if a shift to Direct Address would offer a greater opportunity for audiences to engage more deeply with the characters themselves. Another unusual style choice of note is that these personal histories are told by each of the women ‘from beyond the grave’. They and Picasso have all passed away so now they are seemingly reliving their time with him and searching for an opportunity to gain closure in some way. It could be that by doing this, we are to gain a greater sense of the damage that Picasso did to these women through his actions and it’s certainly true that he doesn’t come out in a positive light. Not at all. It isn’t made entirely clear within the piece how the visual portrayal of each of the women has been chosen but I suspect that the intention is for the women to represent their characters at the last interaction with Picasso (Olivier was liaising with him right up to pension age, Khokhlova and Picasso split when she was 44 and Walter left when she was 31) which, if true, is a great idea and would keep continuity with the focus around Picasso. Surrounded by Gallery Different’s specially curated exhibition, with three pieces commissioned just for this run of shows (worth the trip to the gallery alone), it’s hard to imagine a better setting for Picasso’s Women and with the hard-bright gallery lights shooting off at unusual angles, throwing shadows across the stage area, and the costumes and props for each of the characters representing their real-life counterparts as closely as they are able, whether you have already seen this at the Edinburgh Fringe or not – I would consider this a production not to be missed. Picasso’s Women features a series of monologues and confessionals performed by three of the most influential women in the early life of seminal 20th Century artistic genius, Picasso. 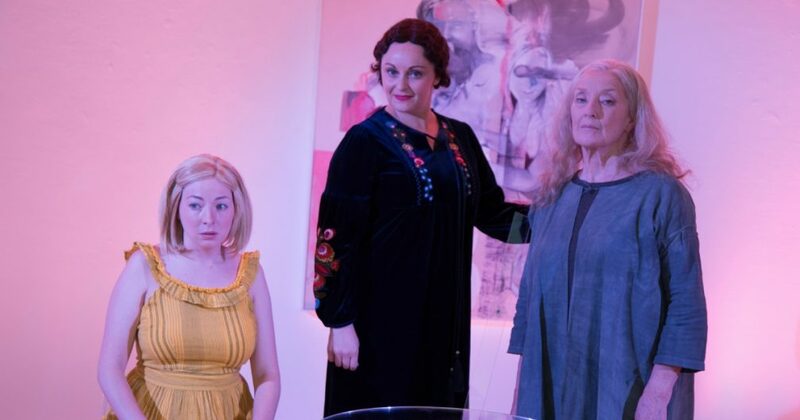 Following a critically acclaimed, sell out run at Edinburgh Festival Fringe, the reimaged production of Picasso’s Women transfers to London this Autumn. Continuing the site specific theme, the play is set in a contemporary art space, Gallery Different in London, from Tuesday 25 – Saturday 29 September at 19:30 (Duration 1h 30m).